Background: Although Posttraumatic Stress Disorder (PTSD) is a severe and disabling anxiety disorder, relatively few people with this condition access evidence-based care. Barriers to treatment are multiple and complex, but the emerging field of Internet therapy for PTSD may improve access to evidence-based treatment. However, little is known about the characteristics of people with PTSD who seek online treatment, or whether they perceive internet treatment as an acceptable treatment option. Methodology: An online survey was used to collect information about the demographic and symptom characteristics of individuals with elevated levels of PTSD symptoms, and this was compared to data from corresponding sample from a national survey. Previous treatment experiences, perceived barriers to treatment and treatment preferences for Internet therapy and face-to-face treatment were also compared. Principal Findings: High levels of PTSD symptoms were reported by survey respondents. Psychological distress and disability was greater than reported by individuals with PTSD from a national survey. Half of the sample reported not having received treatment for PTSD; however, 88% of those who reported receiving treatment stated they received an evidence-based treatment. Primary barriers to treatment included cost, poor awareness of service availability, lack of prior treatment response and not perceiving personal distress as severe enough to warrant treatment. Most survey respondents indicated they were willing to try Internet treatment for PTSD. Conclusions: The Internet sample was symptomatically severe and multiple barriers existed to treatment. 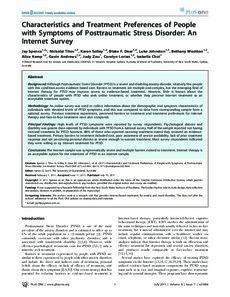 Internet therapy is an acceptable option for the treatment of PTSD in an internet sample.